For the rebranded company, see Santander UK. Abbey National plc was a UK-based bank and former building society, which latterly traded under the Abbey brand name. As the former Abbey National Building Society, it was the first building society in the UK to demutualise, doing so in July 1989. The bank expanded through a number of acquisitions in the 1990s, including James Hay, Scottish Mutual, Scottish Provident and the rail leasing company Porterbrook. Abbey National launched an online bank, Cahoot, in June 2000. In September 2003, the bank rebranded as Abbey, and in November 2004, it became a wholly owned subsidiary of the Spanish Santander Group, with a rebrand following in February 2005. In January 2010, the savings business of Bradford & Bingley was combined with the bank, and Abbey National plc was renamed Santander UK plc. Prior to the takeover, Abbey National plc was a constituent of the FTSE 100 Index. The National Freehold Land Society, officially named the National Permanent Mutual Benefit Building Society to give it legal existence under the Building Societies Act 1836, was established by two Liberal members of parliament, Sir Joshua Walmsley and Richard Cobden, in 1849, joined a year later by John Bright. In 1856, it formed the British Land Company, which separated in 1878. Meanwhile, the Abbey Road & St. John's Wood Permanent Benefit Building Society was founded in 1874, based in a Baptist church on Abbey Road in Kilburn. In 1932 the society moved into new headquarters, Abbey House, at 219–229 Baker Street, London, which it occupied until 2002. The site was thought to include 221B Baker Street, the fictional home of Sherlock Holmes, and for many years Abbey employed a secretary charged with answering mail sent to Holmes at that address. The Abbey National Building Society was formed following the merger in 1944 of what had become Abbey Road Building Society (already the second largest) and National Building Society (at the time the sixth largest). The Swansea Thrift Permanent transferred engagements in 1949, followed by the Definite Permanent in 1968, The State Building Society in 1970, Highgate Building Society in 1974 and the Oak Co-operative in 1979. During the 1970s and 1980s, Abbey National gained a reputation for innovation and, sometimes disruptive, change. It was an early user of computer systems and in the late 1970s, all branches became on-line to a real-time system that maintained customer accounts. Under Chief general manager Clive Thornton, new types of savings accounts were introduced as well as a cheque account. The administration of the cheque account was restricted by building society rules and the need to find a partner that could clear Abbey's cheques (The Co-operative Bank). 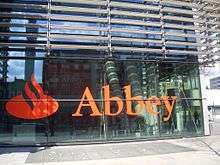 Later, Abbey became a full member of the Bankers' Automated Clearing Services (BACS) and the former Association for Payment Clearing Services (APACS). Thornton also acted to break the building societies' interest rate consensus. The Abbey National Building Society became the first of the UK building societies to demutualise, and became a public limited company as Abbey National plc on 12 July 1989. It was floated on the London Stock Exchange at £1.30 per share, resulting in an unusually large number of small shareholders – approximately 1.8 million initially. The demutualisation process was marred by the discovery of a large number of undelivered share certificates awaiting destruction at a contractor's premises. Abbey National shares peaked at more than £14 in 2000, before the stock market began a long decline. In 1994, Abbey National purchased James Hay, one of the UK's foremost independent providers of self-administered pensions. James Hay then went on to grow in straight and launched Abbey Wrap, the first Wrap a service in which IFAs can keep the clients' ISAs, PEPs, Offshore bonds, and SIPP in one place. Abbey Wrap Managers was FSA approved in 2003. This was relaunched as James Hay Wrap in 2005. In February 1995 Abbey National Baring Derivatives were taken down along with Barings Bank due to failures in regulation and control, especially in regards to Nick Leeson of Barings Bank. Two life assurance companies were demutualised and acquired, Scottish Mutual in 1992 and Scottish Provident in 2001, which enabled Abbey to pursue the bancassurance model. In August 1996, Abbey National took over the National & Provincial Building Society, which was itself the product of a 1982 merger between the Provincial Building Society and the Burnley Building Society. This merger increased Abbey National's branch network by almost two hundred branches and brought in three million more customers. In April 2000 Abbey bought Porterbrook from Stagecoach Group for £773 million. Porterbrook was one of the three railway rolling stock operating companies created from by the privatisation of British Rail, leasing rolling stock to the UK train operating companies. The bank launched its online bank, Cahoot, in June 2000. Lloyds TSB attempted to merge with the bank in 2001, though that was ultimately rejected by the Competition Commission. Abbey also ventured into the wholesale loans business. At first this provided a good profit stream, despite the criticisms of some analysts. This eventually undid the company, however, when Enron turned out to be unsafe and the 11 September attacks in New York damaged confidence in various financial areas. From this point, Abbey struggled from financial losses and a tarnished image. The chief executive, Ian Harley, a long-time Abbey employee, resigned and his post was filled by an outsider, Luqman Arnold. Arnold spearheaded a major reorganisation of the bank in September 2003 that also saw the brand name shortened to Abbey, the abbey.com domain name launched and the Abbey National umbrella logo dropped. Banking literature was also simplified as part of the programme, labelled 'turning banking on its head'. A branch of Abbey on Commercial Street, Leeds showing Santander marketing material in the windows in January 2010. On 26 July 2004 Abbey National plc and Banco Santander Central Hispano, SA announced that they had reached agreement on the terms of a recommended acquisition by Banco Santander of Abbey. Following shareholders' approval at the EGMs of Abbey (95 per cent voted in favour, despite vocal opposition from most of those present) and Santander, the acquisition was formally approved by the courts and Abbey became part of the Santander Group on 12 November 2004. Francisco Gómez Roldán took over as chief executive from Luqman Arnold, who received a rumoured £5 million, made up of pay off and share options. Gómez-Roldán died suddenly in July 2006, three weeks before being succeeded by Antonio Horta Osorio. In June 2006 Abbey agreed to sell its life businesses to Resolution plc. The businesses sold to Resolution were Scottish Mutual Assurance, Scottish Provident Limited and Abbey National Life, two offshore life companies, Scottish Mutual International and Scottish Provident International Life Assurance Limited. Abbey retained all of its branch based investment and asset management business, James Hay, Abbey's self-invested personal pension company and James Hay Wrap. In July 2007 Abbey admitted that errors that it made in the 1980s have contributed to many borrowers mortgage terms being extended by up to 15 years. During this period – which saw considerable turbulence in interest rates – Abbey extended the terms on customers repayment style mortgages without their knowledge. The Financial Ombudsman Service stated that Abbey customers may be eligible for compensation. As a result of the 2008 banking crisis, Abbey purchased the savings business and branches of Bradford & Bingley in September 2008 following the nationalisation of B&B by HM Government. The purchase of Alliance & Leicester by Santander had been agreed earlier that month. Abbey migrated all customer accounts to the Partenon computer software used by Santander in June 2008. On 27 October 2008 Abbey reached an agreement to sell Porterbrook to a consortium of Deutsche Bank, Lloyds TSB and Antin Infrastructure Partners. The Santander Group announced in May 2009 that Abbey and the Bradford & Bingley branch network would be renamed under the Santander brand on 11 January 2010. Credit cards issued by Abbey were the first to change to Santander. 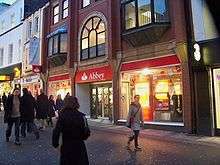 The Abbey name was retained for the Abbey for Intermediaries mortgage division and was retained for a time for Abbey International before the latter was subsequently rebranded as Santander Private Banking. The Cater Allen, James Hay and Cahoot brands remained. Santander UK plc also retained the name Abbey National Treasury Services ltd ("ANTS") for the division responsible for managing its liquidity, risk management and wholesale banking needs. Abbey's registered office was in London (built on the site of the former Thames Television studios in Euston Road) and its main corporate centre in Milton Keynes. Its savings and banking administration departments were in Bradford, with mortgage centres in Thornaby-on-Tees and Whiteley (which was due to close later in 2010). Abbey had Banking Contact Centres in Belfast, Glasgow, Sheffield, and Bootle. Business Banking operations, both administrative and telephony, were also based in Glasgow, having been moved from Taunton and Newport early in 2005. Abbey previously operated contact centres in Derby, Liverpool and Gateshead. The Derby and Liverpool centres were closed as part of a cost-cutting exercise. Those jobs moved to Bangalore and Pune in India in 2003. Following the takeover by the Santander Group, the Gateshead operations also closed in March 2005. Investments were previously branded as Inscape but were renamed Premium Investments in late 2008, provided by Santander Portfolio Management. This was subsequently subsumed into the more general telephony operations and the original contact centre based in Billericay was closed in April 2009. 1 2 "Santander scraps UK bank brands". BBC News. 27 May 2009. Archived from the original on 29 May 2009. Retrieved 23 May 2009. ↑ Santander. "Abbey and Sherlock Holmes". Retrieved 21 August 2015. ↑ Miles Brignall (13 October 2007). "Demutualisation: Should you sell up now?". The Guardian. London. ↑ James Harris (10 March 2010). "IFG acquires James Hay". M&A. ↑ "Abbey National to Buy Scottish Provident". The New York Times. 4 September 2000. ↑ Simon Rex (11 January 2010). "List of demutualised building societies". Building Societies Association. Retrieved 20 March 2010. ↑ Staff writer (20 March 2000). "Stagecoach poised to sell Porterbrook". The Independent. London. ↑ "Abbey National launches Cahoot". BBC News. 12 June 2000. ↑ "Lloyds TSB/Abbey tie-up blocked". BBC News. 10 July 2001. Retrieved 22 September 2013. ↑ "New Abbey boss facing tough task". BBC News. 18 October 2002. ↑ "Abbey revamp to 'turn banking on its head'". Money Marketing. 2 October 2003. Retrieved 16 February 2015. ↑ Ritson, Mark (9 March 2005). "Mark Ritson on branding: Abbey - a case study in how to break a brand". Marketing Magazine. Retrieved 16 February 2015. ↑ William Kay (6 September 2004). "HBOS fury as EU backs Santander's Abbey bid". The Independent. London. ↑ Stephen Seawright (27 September 2006). "Bad loans up at Abbey". The Telegraph. London. ↑ Hilary Osborne (7 June 2006). "Abbey sells life insurance arm". The Guardian. London. ↑ Gill Montia (2 July 2007). "Abbey Borrowers Face Lengthened Mortgage Terms". The Banking Times. ↑ Santander Group Santander (29 September 2008). "Bradford & Bingley's direct channels and retail deposits to transfer to Abbey". Archived from the original on 14 February 2009. Retrieved 20 March 2010. ↑ "A&L shareholders approve takeover". BBC News. 16 September 2008. Retrieved 10 August 2009. ↑ Flinders, Karl (13 June 2008). "Abbey completes Partenon core project". Computer Weekly. ↑ "Porterbroook Leasing sale agreed". Railway Gazette International. 27 October 2008. ↑ "Santander to rebrand UK banks". Hilary Osborne, The Guardian. London. 27 May 2009. Archived from the original on 30 May 2009. Retrieved 24 June 2009. ↑ Fran Duckett-Pike (30 March 2010). "Santander set to axe 160 jobs at Whiteley call centre". The News. Retrieved 3 October 2010. ↑ Santander UK plc. "Premium Investments: Savings: Santander". Retrieved 20 March 2010.